When you hire our team of experts to complete a home renovation of any kind, you gain access to nearly three decades of knowledge and experience in the industry. Whether you don’t have time to plan and oversee the entire project, or simply just don’t want to be in charge of the project, Wineteer Construction is your go-to resource to plan and complete the project from start to finish. 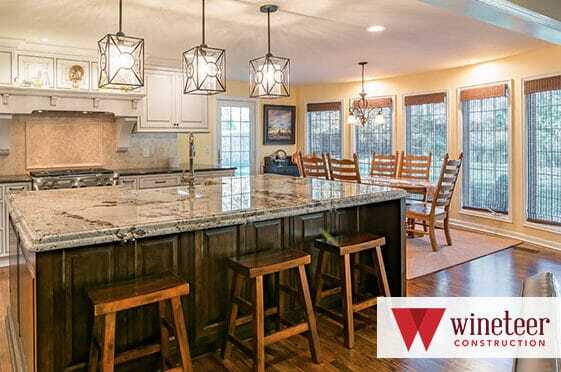 We want to take you behind the scenes and unveil the extent to which the Wineteer Construction team can take care of you and your remodeling needs through project coordination. What follows are a few of the many expectations we will exceed as your home remodeler. Right from the beginning, you can expect our team to discuss and analyze your remodeling needs, budget, deadlines and project scope. We want to create your dream home, and we know that’s only possible when we dig deep into the details with you from the get-go. We will define your goals, create a plan and monitor progress along the way. Wineteer Construction will always maintain open communications with you to ensure your satisfaction and to hold our team accountable to your project wishes. We will hold meetings as needed to keep you in the loop and discuss any necessary updates or changes. Accessibility is essential to communication; so you can expect to reach our team quickly and easily. On top of communicating effectively with our customers, we will also maintain communication with any sub-contractors, outside vendors, plumbers, etc. that may also be involved in the project so you don’t have to worry about making sure the right people are present at the right time. We have you covered. We understand change happens and bumps in the road occur. Our team has been well equipped to assess situations as they occur and resolve any situations that may arise. When you come to us with project updates or plan changes, we will refine, revise and maintain project quality as we alter the original plans to your wishes. Our customers’ satisfaction is and will always be our main priority. Using Buildertrend as our project management software, our team has shared access to scheduling, task management, change orders, documents, photos, warranty, homeowner selections, and much more. The bonus is that it helps to keep our clients up-to-date on their project status on a real-time basis. Clients can easily approve designs, view photos and documents, track budgets, make payments, and more. To truly see success happen, we ensure proper oversight and management of projects by personally getting involved in the work. Whether that looks like being on site to check project process or making necessary phone calls and reaching out to the right people such as sub-contractors, plumbers, etc. to get the job done, rest assured that Wineteer Construction will be actively involved every step of the way. Schedule your next remodeling project, and let us take care of all the nitty gritty details for you!